Pair the classic braised beef short-ribs with an Asian staple food to satisfy your hungry local diners. Sear the beef shortribs until brown, then set aside. Heat oil in a pan. Saute the onions, carrots, and celery. Deglaze with beef stock, then transfer into a cooking pot. Add back the beef shortribs into the pot. Stir in Knorr Tomato Pronto. Season with salt, pepper and Worchestershire sauce. Combine all the ingredients for the gremolata in a mixing bowl and mix well. Combine all the ingredients in a mixing bowl and mix well. 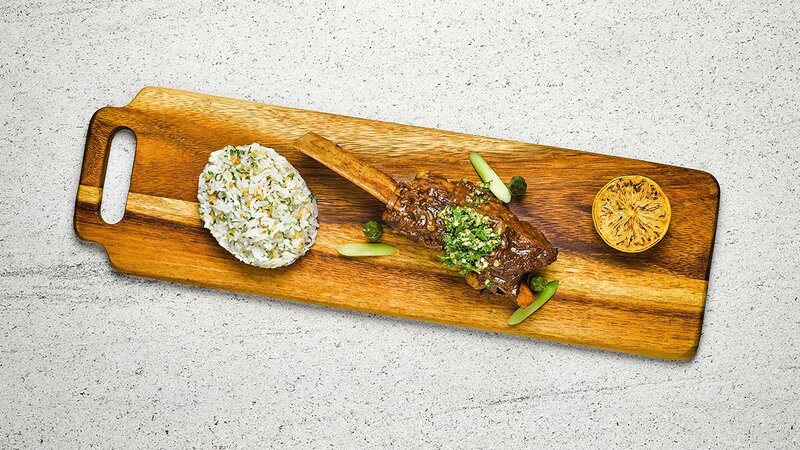 Serve the rice and beef shortribs on a long wooden board. Sprinkle the gremolata on top of the beef shortribs.